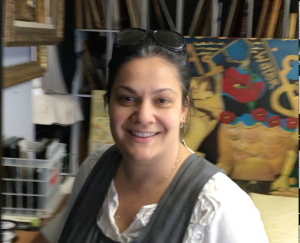 A business properly run is a “team sport” and Oriana is a major reason for the quality art conservation treatments and client services performed at FACL (see quick video testimonial at end of this article). Here is a quick review of her background. Ms. Montemurro began her professional training at the Italian three year art conservation program at Lombardy regional conservation center, Ente Nazionale A.C.L.I. Istruzione Professionale (ENAIP), in Botticino (Brescia) in 1998. This government program was recognized and supported, at the time, by the Istituto Centrale del Restauro (ICR) in Rome. The curriculum focused on the standards of practice and ethics of professional art conservation and the treatments of easel paintings, affrescos (murals) and polychromed sculpture. In 2001 Fine Art Conservation Laboratories was asked by ENAIP to allow their exceptional graduate student, Oriana Montemurro, to undertake a post masters-degree-level graduate internship at our lab in CA. Oriana arrived at FACL during a time when several major and highly prestigious art conservation projects were underway. A large team of conservators worked together (both on site and in the lab) on the very famous 24 large canvases by Harry Anderson of the stories of the New and Old Testament for the North Visitor’s Center on Temple Square in Salt Lake City and on 4 very large canvas paintings for the Crocker Estate stone castle on Pescadero Point in Carmel, CA… a baptism by fire, if you will. 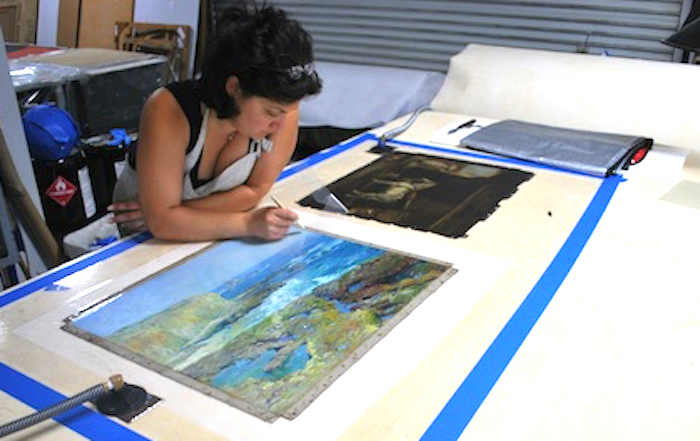 Oriana Montemurro, Art Conservator, working on the hot table lining a painting. Upon her return to Italy, the American 20th century art conservation experience set Ms. Montemurro apart from her colleagues who were submerged in their antiques and Old Master projects. Doors opened for her to work with the most well known art conservation labs in Turin, Italy who worked on 20th century art. Between working on projects in Turin, Genova and Florence, her schedule was very full between 2002-2006. But the American experience left a strong impression on her and in 2006 Ms. Montemurro reconnected with FACL in the hopes of not only collaborating again but to be a permanent part of the Santa Barbara lab. Her timing was perfect as the work load at FACL had required that another art conservator be hired and Head of Conservation, Scott M. Haskins, chose her from a number of highly qualified applicants and made her a permanent part of the staff in 2007. All painting conservators at FACL have the skills to do excellent quality treatments for all the tasks that are required. That is to say, no one is specialized to do a narrow range of jobs. All professional art conservators understand the sensitivities and science of cleaning, the varying techniques of inpainting different types of paintings, confronting in various ways the problems of structural treatments, are able to sensitively apply the many options in the varnishing process and utilize all the entry level analytical techniques in the profession. In addition, it is required of all art conservators to do estimates, understand client needs and communicate clearly with our clients… actually, more than that… they must have excellent people skills. Those who have met and worked with Oriana will quickly recognize that the above list of quality capabilities is satisfied very easily by her and Ms. Montemurro presents herself effortlessly with the professional stature that comes from an enthusiasm for her work and for the team at FACL. Now, after more than a decade, her indepth experience on both in-lab projects and on mural projects is a valuable knowledge base of a seasoned professional. At this point of her career, she has been an essential team professional on over 5000 painting conservation projects, and that number is growing quickly.